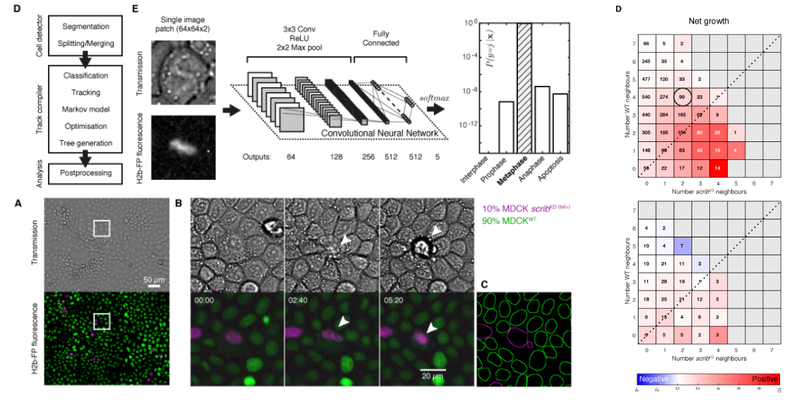 CellX is an interdisciplinary project to use automated microscopy, 'omics data, mathematical modelling and artificial intelligence to reverse engineer competitive interactions in cell populations. The aim of this project is to use state-of-the-art machine learning (ML), automated time-lapse microscopy, and proteomics to understand cell competition. Cell competition is a phenomenon that results in the elimination of less fit cells from a tissue - a critical process in development, homeostasis and disease. The viability of loser cells depends strongly on context: when they are cultured alone, they thrive, but when in a mixed population, they are eliminated by cells with greater fitness. In development, competition acts in pattern formation as well as a quality control mechanism. In ageing, competition may eliminate senescent cells from tissues to prevent age-related pathologies. In stem cell niches, competition may determine which cells differentiate and which remain pluripotent. Figure 1: Characterising cell competition with automated time-lapse microscopy, machine learning and physical models. A number of mechanisms of cell competition have been identified to date involving either biochemical competition (for example through competition for pro-survival growth factors) or mechanical competition (for example a fast growing clone compresses cells in a slow growing clone, which results in cell extrusion for the now denser slow growing clone). While competition was initially thought to take place only at the interface between cell lineages, the discovery of mechanical competition revealed that this is not necessarily the case and that extrusion may take place several cell diameters away from this interface. To date, the vast majority of studies have examined the biochemical mechanisms of competition in single cells and competition at the population level, however it is becoming increasingly clear that the topology of the tissue plays a central role in determining the outcome of competition. Despite this, cell competition remains poorly understood -- we do not know the interaction "rules" that determine each cell's fate. This is largely because most studies only quantify whole population shifts for very few time points and for few cells. One major obstacle to understanding how population shifts occur as a result of single cell behaviours is that it requires thousands of cells to be tracked over hundreds of time points. To address this challenge, we recently built the first deep learning and automated single-cell microscopy system to analyse cell competition. We used deep convolutional neural networks to analyse the cell cycle state of millions of single cells in mechanical competition, including cell division and death. Figure 2: Computational cell tracking using our Sequitr package. In this project, we will use the full scope of the information contained in our time-lapse data to determine the physical and topological parameters that govern cell competition. We will develop a deep learning approach to extract time-dependent features of a single-cell's environment that predicts its fate in biochemical and mechanical competition. We will use the ML model to determine what physical and topological features govern cell competition. We will combine ML and proteomics to identify proteins involved in the commitment pathway, determine their hierarchy in the signalling cascade, and identify convergent pathways. Bove A, Gradeci D, Fujita Y, Banerjee S, Charras G and Lowe AR. The CellX project is generously supported by the BBSRC and EPSRC.